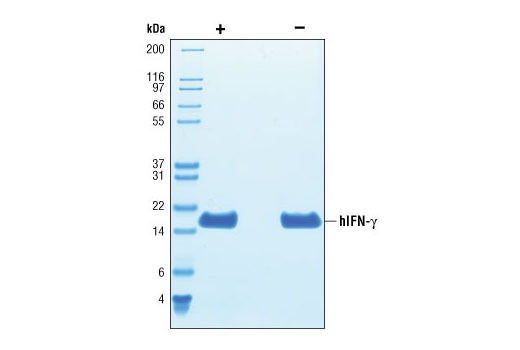 The purity of recombinant hIFN-γ was determined by SDS-PAGE of 6 µg reduced (+) and non-reduced (-) recombinant hIFN-γ and staining overnight with Coomassie Blue. The bioactivity of recombinant hIFN-γ was determined in a virus protection assay. HeLa cells were pretretated with increasing concentrations of hIFN-γ for 24 hours. Cells were then innoculated with encephalomyocarditis virus (EMCV) and incubated for an additional 48 hours. Surviving cells were then fixed and stained with crystal violet and the OD595 was determined. 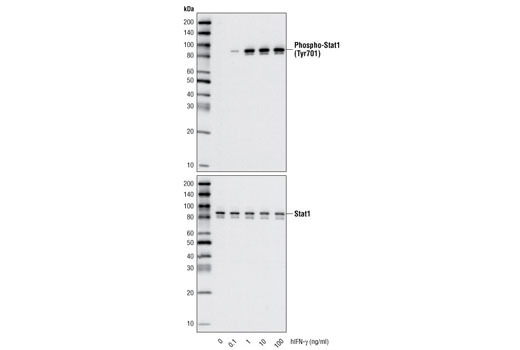 Western blot analysis of extracts from HeLa cells, untreated or treated with hIFN-γ for 20 minutes, using Phospho-Stat1 (Tyr701) Antibody #9171 (upper) and Stat1 Antibody #9172 (lower). Recombinant human IFN-γ was expressed in E. coli and is supplied in a lyophilized form. A greater than 95% purity was determined by SDS-PAGE. Endotoxin levels are less than or equal to 1 EU / 1 μg hIGF-II. >96% as determined by SDS-PAGE of 6 μg reduced (+) and non-reduced (-) recombinant hIFN-γ. All lots are greater than 96% pure. Recombinant hIFN-γ has a Met on the amino terminus and has a calculated MW of 16,907. DTT-reduced and non-reduced protein migrate as 17 kDa polypeptides. The expected amino-terminus MQDPY of recombinant hIFN-γ was verified by amino acid sequencing. 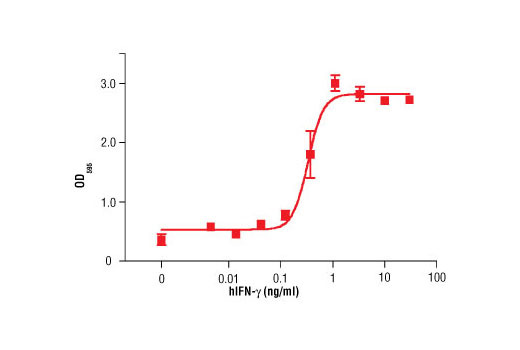 The bioactivity of hIFN-γ was determined in a virus protection assay. The ED50 of each lot is between 0.30-1.2 ng/ml. Less than 0.01 ng endotoxin/1 μg hIFN-γ. With carrier: Lyophilized from a 0.22 μm filtered solution of PBS, pH 7.2 containing 20 μg BSA per 1 μg hIFN-γ. Carrier free: Lyophilized from a 0.22 μm filtered solution of PBS, pH 7.2 with trehalose. Stable in lyophilized state at 4°C for 1 year after receipt. Sterile stock solutions reconstituted with carrier protein are stable at 4°C for 2 months. Maintain Sterility. Do not store frozen. IFN-γ plays key roles in both the innate and adaptive immune response. IFN-γ activates the cytotoxic activity of innate immune cells such as macrophages and NK cells (1,2). IFN-γ production by NK cells and antigen-presenting cells (APCs) promotes the cell mediated adaptive immunity by inducing IFN-γ production by T lymphocytes, increased class I and class II MHC expression, and enhancing peptide antigen presentation (1). The anti-viral activity of IFN-γ is due to its induction of PKR and other regulatory proteins. Binding of IFN-γ to the IFNGR1/IFNGR2 complex promotes dimerization of the receptor complexes to form (IFNGR1/IFNGR2)2 -IFN-γ dimer. Binding induces a conformational change in receptor intracellular domains and signaling involves Jak1, Jak2 and Stat1 (3). The critical role of IFN-γ in amplification of immune surveillance and function is supported by increased susceptibility to pathogen infection by IFN-γ or IFNGR knockout mice and in humans with inactivating mutations in IFNGR1 or IFNGR2. IFN-γ also appears to have a role in atherosclerosis (4). Voigt, E. et al. (2013) Virol J 10, 224.